Literata (ok, that was over a year ago; I’ve been wandering through various people’s archives) talks about a witch’s landbase, meaning the local land in which an Earth-based witch or Wiccan bases her practice, her bit of Earth, from which she draws power, and which she serves. And I’ve been thinking about it, and I realize I’ve never connected with the land here much. When I started practicing, I was still in high school, living in the house I’d been in since I was five. I knew that land there intimately. I never had to think about a connection with it. I had my bit of beach, my tree in my own yard, my favorite places in the swamp beyond the yard. AH! BROKEN IS THE GOLDEN BOWL: THE SPIRIT FLOWN FOR EVER! LET THE BELL TOLL – A SAINTLY SOUL FLOATS ON THE STYGIAN RIVER; COME, LET THE BURIAL RITE BE READ, THE FUNERAL SONG BE SUNG; AN ANTHEM FOR THE QUEENLIEST DEAD THAT EVER DIED SO YOUNG, A DIRGE FOR HER, THE DOUBLY DEAD, IN THAT SHE DIED SO YOUNG! I love an old cemetery, from before modern embalming practices, from before we sealed the dead up in airtight steel caskets and put them in cement vaults. These are places where people return to the earth that gave them life. It’s special to me. It was a quiet place in the middle of the most urban and built-up part of Tallahassee, between the two big campuses and only a mile or two from the capitol building (which, for those that don’t know, is … ithyphallic, shall we say? An erect phallus, complete with testicles). Once, I got there and heard bagpipes. There was a piper walking the perimeter, practicing. Lots of little things happened to me there. I found a branch that became my wand. Other things I won’t mention. And then I moved to Seattle. It’s a far bigger city than I’ve ever lived in before. When I first got here, I had no car, the bus system baffled me (and it isn’t very good), and I got immediately lost whenever I got too far from my tiny apartment. The land and I made a few overtures to connect with each other, but it never really happened. Eventually, I found Golden Gardens beach, which I love, but it’s always so full of people, it’s hard for me to find the peace I’ve always had at the beach at night. The water was cold, and a bit foreign. The Sound is salt, but so far from open ocean that you can’t even see it. There’s no watery horizon, clean of land. I made it out to La Push beach on the peninsula once, which is much more my sort of thing, but it’s a long enough drive to be impractical without an overnight stay, and I haven’t had the time and money at once to do it again. A few years, I’ve been out to a festival at Fort Flagler State Park, which overlooks the Sound and the Straight of Juan de Fuca (sort of), and which, in the mist that’s usually hanging around in Spring when I’ve been, almost looks like there might not be land right there. I’ve never found a tree to love, either. My knees are bad and getting worse, and going for long walks to find places to feel happy is less and less often an option. I never found a community to serve here, either. I can’t help but connect not having a land-base with not having a community to serve. I’m renewing and deepening (re-deepening?) my practice after several years of not keeping regular ritual or worship. When I owned a restaurant, that ate all of my life. I still had a ritual room in the house, I still felt my dedication to Hecate and to Dionysos. I designated the restaurant as a shrine to Hestia, and its pilot lights as her eternal flames. I kept a statue of Hermes in the office, and asked him for help with business and money. But I kept no practice that fulfilled me personally. But now I’ve started doing my morning ritual again, and I’m doing a tarot study as a way of warming up my symbolic-thinking muscles. I’m keeping the ritual of Hekate’s Supper at the new moon, and worshipping Dionysos ecstatically when I need to. I can tell it’s starting to work, because the little synchronicities are starting again. The same topics or phrases coming up repeatedly through a day, a friend mentioning a video I’ve never heard of, then coming home to find it on my Tumblr dash. They don’t mean anything yet, but that I’m seeing them again means I’m paying attention more. It’s a good thing. I stopped weaving for a while. Ran out of steam on the big piece, focused more on spinning for the Tour de Fleece, then burned out on that. Frustrated. But I’m starting that up again, too. 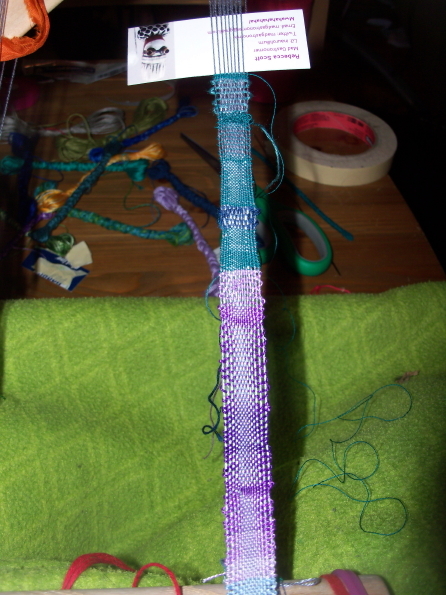 I’m working on a set of Saori-styled straps that were originally part of a Ravelry weave-a-long, which is now long over. 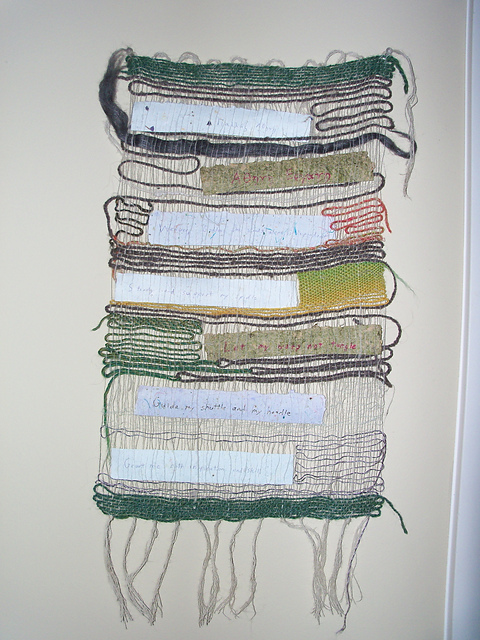 It’s not complex, but it lets me flex my intuitive-weaving muscles a bit before I go back to the seascape. I’ve mostly abandoned WordPress since I found out they reinstated a blog that outed, harassed and threatened trans women — not incidentally, but as the central mission — after WordPress had taken it down for terms of service violation. I’m trying to find another blogging platform that I like, but the platform I did find and was starting to move things to shifted to a pay model, and I simply don’t have the funds at the moment to spend anything at all to maintain a blog. I wouldn’t post this, but I really wanted to put these thoughts down in a space dedicated to religion and magic rather than my personal LJ, and I have this. I really don’t want to generate more content for this site, and as soon as I can, I’ll be moving this blog elsewhere. But this is going here for now. And here’s a shot of the straps, which are on a backstrap loom I made myself, and made too narrow, so it’s kind of a pain to use.